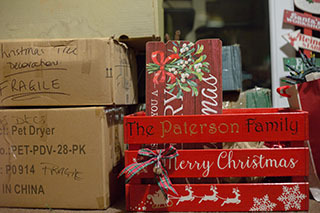 Last weekend was full of mixed emotions ….. the Christmas tree is being put away! 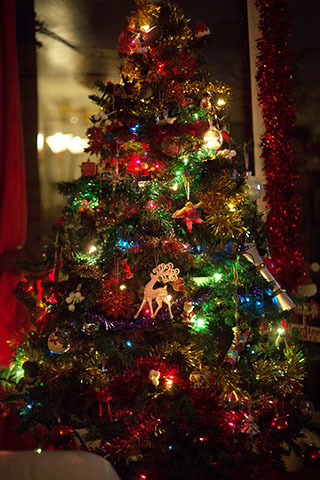 Christmas trees are seen as a symbol of Christmas; waiting for the presents and having families around for the special day. I see my Christmas tree as a tree of memories – every single decoration on my tree evokes a different memory – of a time or person, and I absolutely adore having the tree in my front room. If I had the room, I would literally leave it there all year! I love getting the boxes of decorations down from the loft. It’s a job my husband has to do, as I end up a quivering wreck even just considering the gap between the top of the ladder and the hatch! So I have to be nice to him for a few days, but it’s worth it – I can’t wait to get my hands on those boxes! Each decoration is lovingly unwrapped and I’m afraid to say, spoken to – although sometimes it does have to be silently – especially if long-suffering hubby is watching! As I hold each decoration, I remember where and how this decoration came to me. There is nothing like holding something you love, don’t you agree? I love my little pink fairy. We bought her on a visit to Cologne’s Christmas Market a few years ago. She, to me, represents serenity in loving who we are. She may not an obvious symbol of Christmas, but she belongs on my tree! She’s not the typical Christmas Angel; she’s not tall and white – she’s cuddly and pink – a lot like me really! I especially love the look on her face – serenity in pink! I like to believe that she loves being on my tree – she’s different, she’s sassy and proud of being a pink Christmas Fairy! 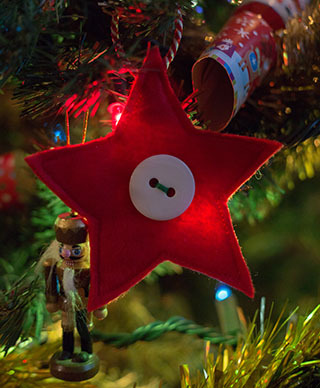 My lovely star – made by the lovely Robyn. We had a £1 Secret Santa pressie swapping do and this was one of the hand made presents made by Robyn for me. What I particularly remember though, was that this present wasn’t just made for me, it was hand delivered! Luckily the house was looking spick and span when the door bell rang, and there was Robyn! It was fabulous to see her, have a chat and to wish her Happy Christmas. A memory I will always love! There used to be a large shop in Bracknell called Bentalls, that is no longer there unfortunately, but had a HUGE Christmas department that my sister loved working in during her break from University. 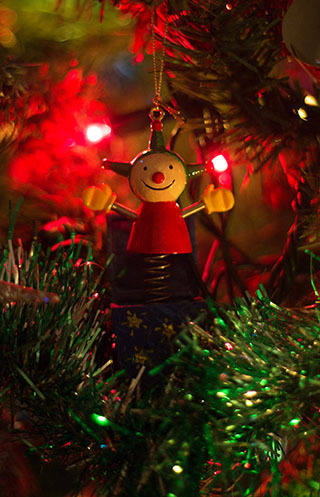 That meant that all the family received amazing decorations for our trees every year! This Jack in the Box is just one of them, and I absolutely love him. Seeing him, I still see my sister during her Uni years; wearing tie-died leggings, a blue clown’s wig and an oversized black long coat she “borrowed” from our Dad! If you’re lucky, or if you insist, I can tell you the story, but for now, it’s well and truly ensconced in my brain, and something this little decoration brings to mind when I see him. Every year, I try to take photos of the dogs in front of the tree. This year was Tillie’s turn. At 15 and a half now, we have to be realistic in that this may have been her last Christmas with us so I wanted to get something different. The poor girl; we don’t have a huge amount of space in front of the tree, so I was literally in her face taking this. Luckily for me in a way, she’s blind immediately around her face, so she didn’t see the camera – luckily for her, she was in licking distance – I got a wash I wasn’t expecting soon after this was taken! 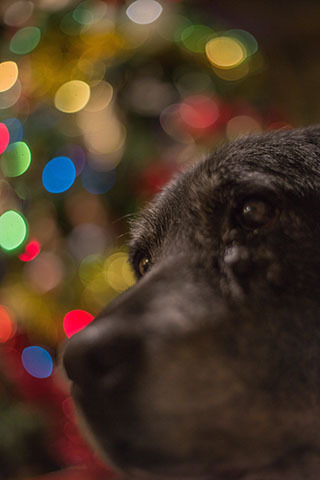 I love the pretty bokeh created by the tree – it’s so pretty; just like Tillie! It’s a sad day to see the boxes piled up where the tree once stood. In my heart I know I’ll be seeing all my memories again next year, when I’ll lovingly open up these boxes again and will greet each decoration with joy and love and memories! Fighting temptation to put the tree back up again! My husband has been away all weekend, and isn’t due home for long enough to put the decorations back up into the loft until Friday morning – so I have to spend a week looking at boxes of my memories. The temptation is pulling at me to put the tree back up again! I wonder how long I can hold out for!